This sprung door handle is fully reversible, the handle has a simple and contemporary design with some sculpted detail, without being too elaborate or fussy. The handle levers are sprung, solving the problem of a sagging door handle not returning to the horizontal position when not in use. There are only two measurements which are required to ensure full working operation of your new uPVC door handle. The first one being what is known as the PZ measurement. This measurement is the distance from the centre of the key hole the to centre of the handle lever or spindle hole. This is measurement B on the technical diagram. 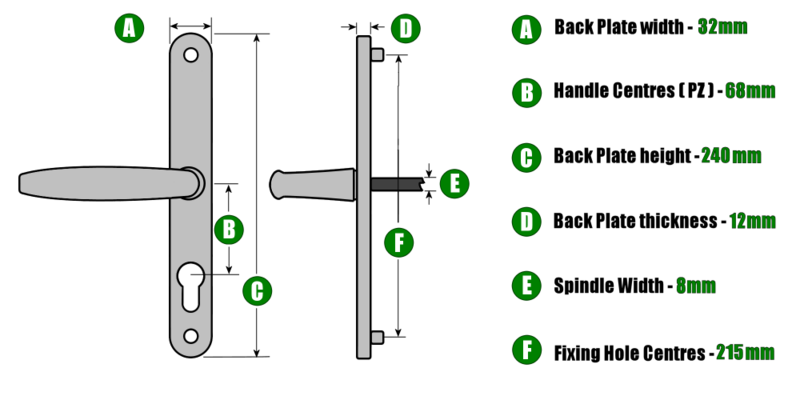 The second measurement is the distance between the two fixing points which are the screw holes on the uPVC door handles backplate. This is measurement F on the technical diagram. If the above two measurements match up then the door handle will fit and operate perfectly. All other measurements on the door handle are mainly aethetics and won't affect fitting or operation if they're different.